Dr. Krassioukov is the Associate Director of Rehabilitation Research for ICORD. He is also a Professor in the Department of Physical Medicine and Rehabilitation at the University of British Columbia, and a physician in the Spinal Cord Program at Vancouver Coastal Health’s GF Strong Rehabilitation Centre. He obtained his M.D. from Volgograd State Medical School, Russia, and his Ph.D. from Ivan Pavlov Institute of Physiology, Russian Academy of Science, St. Petersburg, Russia. 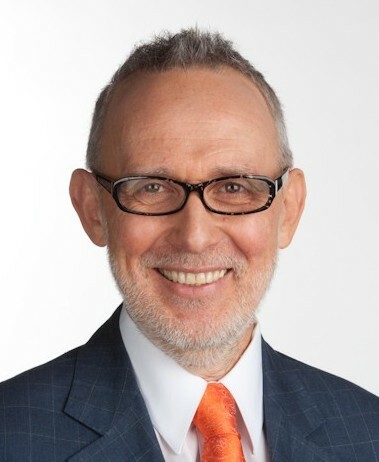 He is President of the American Spinal Injury Association (2019-2021). As Principal Investigator on a recently awarded CIHR team grant, Dr. Krassioukov will be working with four major SCI research and rehabilitation centres (Vancouver, Toronto, Hamilton, and Winnipeg), focused on cardiovascular health in individuals with chronic SCI: locomotor training, education, and knowledge translation. For more information on this research click here. Dr. Krassioukov is involved with educating healthcare providers, physicians, and paramedics, to diagnose, treat and prevent AD, which in turn will reduce the number of hospital days for these patients. This represents an enormous cost saving as well as a large improvement in the lives of individuals coping with AD. This work will give emergency room physicians and paramedics a set of guidelines and education for dealing with AD. He is working with Drs. Susan Harkema of the Frazier Rehab Institute in Louisville, Kentucky, Larry Vogel of Shriners Hospitals for Children in Chicago, Illinois, and Stephen Williams of the Boston Medical Center. 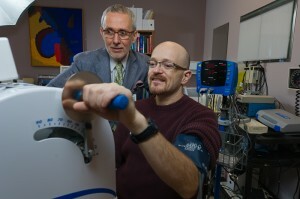 (L – R) Dr. Andrei Krassioukov with Dean Stoney, working on cardiovascular health on an arm ergometer. Dr. Krassioukov’s basic and clinical research has been focused on AD following SCI for more than 20 years. He has developed a multi-disciplinary laboratory that is now internationally known for numerous basic science and clinical innovations in the area of AD following SCI. This serious complication of SCI was unrecognized until recently; twenty years ago, reviewers of his first grant studying the effect of SCI on the cardiovascular system believed that people with SCI didn’t need to worry about cardiovascular disease, and that the only focus should be on curing paralysis. Today, autonomic dysfunction is recognized as a major avoidable cause of morbidity in people with SCI, and is even used, at great risk, by athletes with SCI to give them a competitive advantage in paralympic sports. He has pioneered the development of several tools that put research knowledge directly in the hands of those who could most benefit people with SCI, including the creation of a novel education tool for first responders (i.e. paramedics, EMTs), and PleasureAble: a free resource on sexual devices and adaptations for people with SCI, funded by DHRN, a MSFHR Health of Population network. These tools and resources are practical solutions to information gaps that put patients at risk and prevent full enjoyment and quality of life for people with SCI. As a Professor of Medicine at the University of British Columbia, Dr. Krassioukov’s teaching philosophy is to foster critical thinking, creativity, and independence so that students will acquire crucial skills which will prepare them for any job in the future. His strong commitment to mentoring the next generation of clinicians and researchers drives his work as primary supervisor of several trainees. 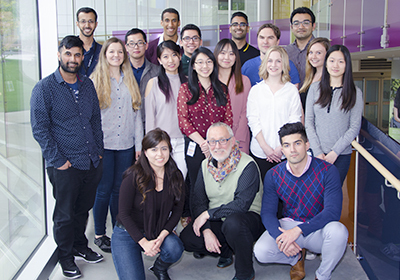 During the last 20 years of his academic career, Dr. Krassioukov has supervised or co-supervised more than 20 graduate students, and what gratifies him most as their supervisor and teacher is to see their success. Dr. Krassioukov also has two residents and four emergency residents at Vancouver General Hospital. 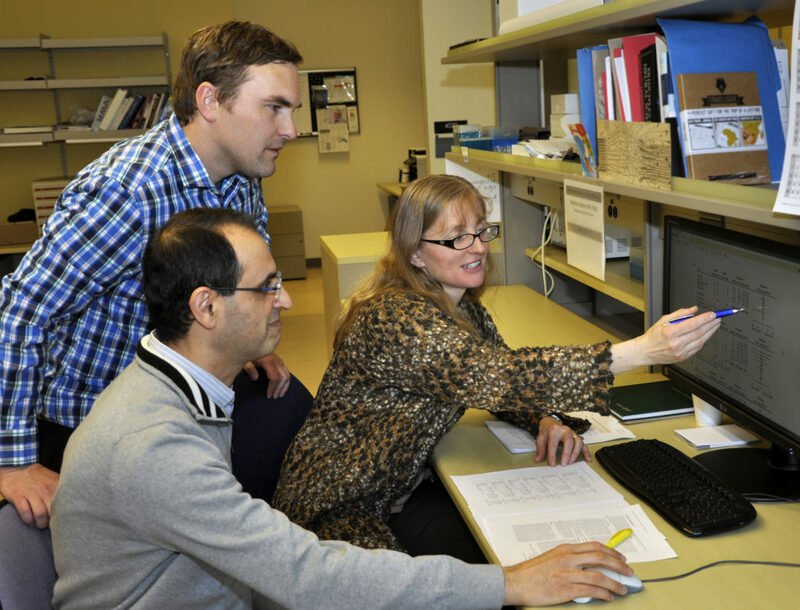 Dr. Krassioukov is accepting applications for a postdoctoral fellow with expertise in human/clinical or experimental research in the area of cardiovascular and autonomic dysfunction following SCI for a 2-year term. Click here to download the full job description. Dr. Andrei Krassiuokov speaks about the CHOICES Project. Dr. Andrei Krassiuokov and his lab members Dr. Aaron Phillips, Jordan Squair meet with Rick Hansen Institute’s John Chernesky to discuss autonomic dysreflexia and spinal cord injury for SCI Awareness month. Dr. Andrei Krassioukov and post-doctoral fellow Dr. Aaron Phillips deliver a presentation on autonomic dysreflexia and spinal cord injury. Dr. Andrei Krassioukov gives an overview of the field of cardiovascular diseases following SCI and his research in that field. Watch Dr. Andrei Krassioukov’s Café Scientifique talk on the cardiovascular health of Paralympic athletes. A stimulating conversation with Dr. Andrei Krossioukov with Unite 2 Fight Paralysis. In this podcast they talk with him about spinal stimulation to seek recovery of autonomic functions for chronic spinal cord injury: bowel, bladder, seal function, blood pressure regulation. 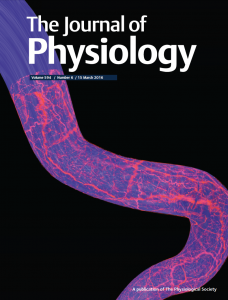 Published on 15 March 2016 in The Journal of Physiology, Volume 594, Issue 6. Nightingale, TE et al.. 2019. Reliability of Cognitive Measures in Individuals with a Chronic Spinal Cord Injury.. PM R. doi: 10.1002/pmrj.12161. Murray, TE, Krassioukov, AV, Pang, EHT, Zwirewich, CV, Chang, SD. 2019. Autonomic Dysreflexia in Patients With Spinal Cord Injury: What the Radiologist Needs to Know.. AJR Am J Roentgenol. doi: 10.2214/AJR.18.20798. Zemmar, A et al.. 2018. Medical and surgical management of acute spinal injury during pregnancy: A case series in a third-world country.. Surg Neurol Int. doi: 10.4103/sni.sni_380_18. Walter, M, Lee, AHX, Kavanagh, A, Phillips, AA, Krassioukov, AV. 2018. Epidural Spinal Cord Stimulation Acutely Modulates Lower Urinary Tract and Bowel Function Following Spinal Cord Injury: A Case Report.. Front Physiol. doi: 10.3389/fphys.2018.01816. Evaluation of cerebrovascular health after SCI using MRI.